Jim Albers ’44 sends along this list of items for the women. We do not recommend that this be framed and hung in the kitchen. Men see only in 12 colors. Peach, for example, is a fruit, not a color. Pumpkin is also a fruit. We have no idea what mauve is. Christopher Columbus did not need directions. Neither do we. Get used to the toilet seat. You are a big girl. If it's up, put it down. We need it up, you need it down. You don't hear us complaining about you leaving it down. If you think you are fat, you probably are. Don't ask our opinion. Come to us with a problem only if you want help solving it. Discussing problems does not solve them. Anything we said 6 months ago is inadmissible in an argument. Any promises become null and void after 7 days. If we ask what is wrong say "nothing,” we will act like nothing's wrong. When we have to go somewhere, absolutely anything you wear is fine. 17. You have enough clothes. Last fall I was on my way to northern Wisconsin for a Muskie fishing junket when I stopped at a grocery market to pick up a few things. Now I have been trying to catch a muskie for years without success so this day was one of hope. Well, when I came out of the store there was a van parked in front of me and the license plate had “A M D G” on it. My mind immediately kicked back to Campion where at the start of every first class “A M D G” was written on the upper right corner of the blackboard. “To The Greater Glory Of God". I knew right then that that day I was destined to catch my first muskie and lo and behold about two o'clock in the afternoon I landed a beautiful 36" prize. Many will recall that on July 8, 1947 witnesses claimed that an unidentified object with five aliens aboard crashed onto a sheep and cattle ranch outside Roswell, New Mexico. This is a well known incident that many say has long been covered up by the U.S. Air Force and the Federal Government. However, you may NOT know that in the month of March 1948 - exactly nine months after that historic day: Albert Arnold Gore, Jr., Hillary Rodham; John F. Kerry; William Jefferson Clinton; Howard Dean; Nancy Pelosi; Dianne Feinstein, Charles E. Schumer and Barbara Boxer were born. See what happens when aliens breed with sheep... This piece of information may clear up a lot of things. Campion High School, just outside Prairie du Chien, Wisconsin was sold the other day to the Wisconsin Lutheran Synod. Those folks are going to rename the place Martin Luther Academy. Marvelous irony that Campion was a Catholic boarding school run by the Jesuits, the fellows who began business back in the 16th century as the pope's special force. They were the Catholic counter-offensive against the Protestant Reformation whose leader was Martin Luther. It appears that the Reformation is winning the battle. The Jesuits had to give up at Campion a few years ago because of rising costs. But they had hoped to get at least $10 million for the place if forced to sell. They did finally sell it this month, but for only $2.8 million. And to Lutherans. You might say that this story would make Blessed Edmund Campion, for whom the original place was named, spin in his grave. He was not in any condition for grave spinning, however, having been well stretched and carved, by Englishmen who dispatched him from this life about 397 years ago. Later he went to Rome as a pilgrim and while there entered the Jesuits. He was ordained in 1578. Two years later he went back to England, sneaking around visiting the clandestine Catholics and trying to avoid capture. He did well for a short time, but he didn't stay on that underground circuit very long. In July of 1581 he was betrayed and arrested. In those days the police used to put people on a body-stretcher called a rack when they were feeling brutal. Campion got the rack several times. He gave them no satisfaction, just kept telling anybody who asked that the “heretics” were wrong and everybody ought to get together again and pay attention to the pope. Something like that. So on Dec. 1 he was hanged, drawn and quartered. And now on top of that the Lutherans get a school named after him at a fire sale price. Something isn't the same. Wisconsin. It certainly has a grand splendor, which I try to catch in an intimate way that the average visitor does not get a chance to see. 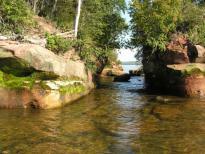 In addition, I have become fascinated by the geology of the area. Also, I am teaching business classes at the Outreach Center at the Red Cliff Chippewa reservation. 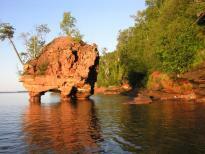 It is a part of the Lac Courte Oreilles Ojibway Community College down at Hayward, WI. This will be my third year of teaching and I am finding it very rewarding, plus it keeps the brain cells from atrophying. I know our ranks are getting smaller, but if any Campion grads get up North, give me a call. Aaron — Thanks for all your back-breaking but very effective work. Keep up your outstanding efforts. I came here as a post-Doctoral fellow in 1963 and received my first faculty appointment in 1967 with joint appointments in the Departments of Physiology and of Medicine in 1978 and 1990. Teach first year medical students…and have since 1978. But mostly do research. Love what I do with no plans to retire…yet. The Lord said, "Your request is materialistic, think of the enormous challenges for that kind of undertaking; the supports required to reach the bottom of the Pacific and the concrete and steel it would take! It will nearly exhaust several natural resources. I can do it but it is hard for me to justify your desire for worldly things. Take a little more time and think of something that could possibly help mankind." The biker thought about it for a long time. Finally, he said, "Lord, I wish that I and all men could understand our wives and girlfriends; I want to know how she feels inside, what she's thinking when she gives me the silent treatment, why she cries, what she means when she says nothing's wrong and how I can make a woman truly happy??" CARL BACHLE ’48 REMINISCES ABOUT THE OLD GIRL. IT WAS A SCHOOL WHERE WE WERE EXPOSED EVERY DAY TO "EXTREMIST" VALUES LIKE SELF DISCIPLINE, PERSONAL RESPONSIBILITY, CHRISTIAN MORALITY. A SCHOOL WHERE THE JESUITS TAUGHT US ABOUT BEHAVIOR STANDARDS. AND PATRIOTISM. AND YES, THE EXISTENCE OF GIRLS RIGHT THERE IN RIVER CITY. IT WAS A SCHOOL WHERE WE GOT TO KNOW THE DEDICATED JESUIT PRIESTS AND SCHOLASTICS, BOTH AS ROLE MODELS AND AS REAL PEOPLE. IT WAS A SCHOOL WHERE WE SAW THAT PIETY AND SCHOLARSHIP AND GOOD STUDY HABITS, WERE ALL COMPATIBLE AND INDEED, WORTHY GOALS. IT WAS A SCHOOL WHERE WE WENT TO MASS EVERY DAY - EVEN WHEN IT HIT 30 BELOW OUT THERE IN THE WISCONSIN BOONIES. BUT WE WERE IMMERSED IN THE RICHNESS OF THE CHURCH, THE SOLID OLD HYMNS, THE ANCIENT LATIN LITURGY, THE SILENCE AND BEAUTY OF THE CHAPEL IN THE SNOW. IT WAS THE GOOD LIFE, EVEN IF WE DIDN'T KNOW IT OR APPRECIATE IT THEN. AND FOR ALL THAT, WE THANK OUR PARENTS WHO GUIDED US AND SUPPORTED US. BUT OUR MOST SPECIAL THANKS GO TO THE MEN OF THE SOCIETY OF JESUS. THEY DID THEIR BEST FOR US - IN SPITE OF IT ALL! It all began on August the sixth of 1930 at 10:30 am in South Bend when I slud out of my nice warm cave kicking and screaming. As I have told you before I wanted to be called Wolf Blitzer, but I had heard them talking about me being called Aaron Henry Jr. and that's the way it was. Completely out of my hands. Several years later a young whippersnapper was born and he got my name. I remember nothing from those very early years. I ‘spect that I was your average brat. My Mother was sickly and in the late fall of 1939 it was recommended that she would be better off in Florida for the winter. Dad and I drove down and Mom and the girls, Anne (age 7) and Jane (age 2) came later by train, accompanied by a teenaged baby sitter / nursemaid for Janie-Poo. In registering for school it was determined that I should be in the 6th grade. I had left South Bend a 4th grader. So much for the quality of the Florida educational system at that time. It explains why I was barely 13 upon entering Campion in August of 1943. We lost my Mom on the eve of her 36th birthday, on October 5, 1941. It was probably partly because of that sad event that Dad thought it would be best for all concerned if I spent my high school time in Wisconsin. So a couple of weeks after my 13th birthday, I was on that C.B.&Q. Zephyr headed north. This is my 1st person account of the infamous RIOT & related following events. I have transcribed it from my original 1947 document on CAMPION stationary in all its childish vernacular. There was no title! The year was 1946. On Friday, October 25th, after a pep rally in the gym for the football team, everybody went down to the smoker, which was dark. Some guys moved a billiard table and a leg, which was broken off when I came to Sr. Division (1945), fell off. Some other guys broke a light bulb and a few other guys threw a few books around. That night Fr. Reinert came in study hall and told us that he wanted to know who broke the table. He told us to come to the office and tell him if we knew who did it. Well nobody went to the office so on Saturday after the game we had study hall at 5:15 P.M. We were to have it that night too, if they didn’t confess. Well we didn’t want them to confess so they didn’t. Only a few guys besides the culprits knew who pulled the leg off. Instead of going to study hall that night a gang of 120 or so Senior Divers went out on the football field and refused to go to study hall. There was some vulgar language used but for the most part we were singing. Then a guy came out and told us that we would have to make up the time lost minute for minute with our smokers. That was ok by us so we decided to go in at 8:00 when study hall was supposed to begin. But first we sent a conclave into Fr. Reinert’s office to see what would happen to the guys who moved the table. Fr. Reinert wouldn’t see them for ten minutes so we waited in the stands. Finally when they came out we went to study hall. The next day Fr. T.J. Stemper (President) took over. He started changing the punishments. No one could be checked out if they were out there, neither could they have a town per or go to the movie that night. We got sort of sore about that so everyone started subversive activities. Hooting and yelling in the smoker and almost everywhere. Semi-riots breaking out at the drop of the hat. Then T.J. got madder and madder because he had posted a decree demanding to know the leaders of the Saturday night riot and the culprits of the table. No one confessed so he warned the Senior class in a little talk at noon on Tuesday. You see they kept giving us more and more punishment such as getting up an hour earlier every day and going to study hall at 4:15 and then at 4:30 instead of 5:00 and 6:45 instead of 7:00. We were getting up at 5:30 instead of 6:30 on Tuesday. Then on Tuesday afternoon 3 guys confessed to the table affair. By this time T.J. had a list of Seniors whom he intended to kick out. He started on Tuesday late P.M. He booted 9 seniors and a sophomore out for being the ringleaders on the field at the riot (One Sophomore and nine Seniors: Robert Donahoe, Thomas Grady, Aaron Huguenard, David Hyslop, Robert Lafond, James Lawler, Stephen Medgesy, Donald O'Connor, Frederick O'Connell, and Edward Ring), yet we had no ringleaders and that is the gospel truth. Then all the punishment stopped and it was all over. But you should hear what the people in Chicago think. One guy’s sister thought that the campus was in ruins, some buildings burned etc. Others thought that a mob of 300 mobbed Fr. Reinert in his office on Saturday night. Fr. T.J. had been shot in the hand up on the rifle range, we raided the armory and took the place over by force. These are all the things the people in Chicago believed. But then when the guys started coming home they were horrified. Kicking 9 seniors out. Why at Austin in Chicago 5000 students walked out because they couldn’t have a half day off for winning a football game. No one was kicked out there. Same thing at Fenwick, no one kicked out either. Fr. Bowdern of Loyola, who was the head of something in the province, called up T.J. and told him to stop because of the scandal it was causing. It was said that the President of Notre Dame also called. T.J. really pulled a dirty one on that. I know we were wrong in skipping study hall etc. But he had no right to kick 10 guys out, just because they were out there. Fr. Bowdern said he must have gone mad at the switch as well as Fr. Reinert. Nobody gives a good doggone about the school now. I matriculated to Notre Dame in the fall of 1947. Another CHS grad, Jack Rockne ’44 was also attending ND, and he provided me with a ride to the campus each morning. Now we were TOWNIES! Not knowing where I was going in this world or what I wanted to do, I chose a basic accounting course. Unfortunately among the subjects studied was ancient history, a topic that I had absolutely no interest in. Father Holderith, C.S.C., was the professor. 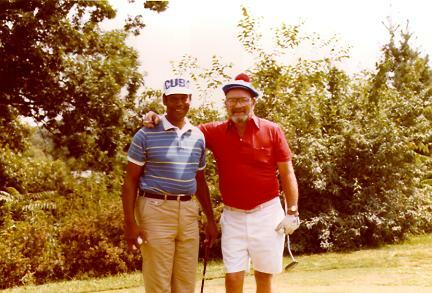 He was also the University golf coach and a lot more friendly in the pro-shop than in the classroom. I managed to flunk the course. After that poor showing I did fairly well until the spring of 1949 when I came down with a severe case of appendicitis. The sucker was full of gangrene. As far as I know it is still in a bottle of formaldehyde in St. Joseph's Hospital in South Bend as a teaching aid. Because of the severity of my problem I was out of school for nearly a month, right at the time for finals. This was not good and prompted my departure from N.D.
During my Campion summers I had a job with an appliance distributor where I watched some fellows setting up and repairing television sets. I was quite taken with the electronics end of this and chose to go to an electronic school in Chicago. I spent a year there, working at night at the Admiral television factory on Chicago's West side. I lived in an apartment on Wilson Avenue just a few blocks from Wrigley Field, so I'd walk a bit on a sunny afternoon and go to watch the Cubbies. Hank Sauer was the hero of the day back then. In August of 1951 I got married, and on the return from honeymooning I found a draft notice waiting for me. It was not unexpected. Because of the electronics training I was placed in the Army Signal Corps and sent to Augusta, Georgia’s Camp (later Fort) Gordon for six weeks of basic training. At the end of that period I was assigned to Fort Monmouth in New Jersey. Here I was educated in the fields of radar and microwaves. I was assigned to a station on the base that was involved in ionospheric sounding. Briefly, the ionosphere had several layers of ionic bands. These move higher or lower according to the sun. Thus, in the evening and night, the lowering is seen in the fact that we can receive far distant radio stations as the transmission can bounce off of the lower layer (D) of the ionosphere. We could frequently pick up KMOX out of St. Louis in South Bend. Once in Fort Myers, FL, we heard WGN in Chi come in loud and clear. In a few months we began to prepare for a trip to the Marshall Islands in the South Pacific to be involved in the first hydrogen bomb test… “Operation Ivy”. Six of us made the trip. There was at this time a general rank freeze in the military. We were all drafted PFCs. Our C.O. wanted some sort of leadership in the group. So I was promoted to an acting (temporary) corporal. (read: RINGLEADER). In early November of ’52, we flew from N.Y. in a non-sched airliner (DC-3). As we flew toward Los Angeles the pilot would periodically land and get out on the wing and “fillerup”. This was a bit disheartening, but we arrived safely. At that point we got on a regular commercial airliner for the trip to Travis air base in San Francisco. 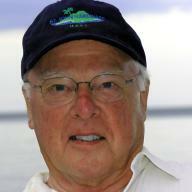 In a couple of days we took off for the Eniwetok Atoll in the Marshall Islands. After few days of R and R on the island of Eniwetok, we were loaded on an LST with our equipment to leave for the island of Bikini in the Bikini Atoll. If you want to take a boat ride I suggest you do not use an LST. 24 hours later we arrived at Bikini, a 200 mile trip. This would be our home for two months. We set up our tents on the lagoon shore and took the rest of the day off. We had three Air Force men on the island to prepare our meals. They had two very large walk-in kerosene refrigerators, one filled with beef and the other Budweiser. We were a bit pissed that the flyboys charged us a dime a can. However they did cook up a swell steak on a very large charcoal grill. The next morning we drove our supply truck across the island to install our equipment. We strung a “long wire” antenna a mile along the ocean shore. Our van carried a large amount of exotic electronic equipment, later to be driven by a very big generator. Our task was to determine if this hydrogen bomb would disrupt radio communication. Remember here your ionospheric lesson. No one knew what would happen when the first H-bomb went off. 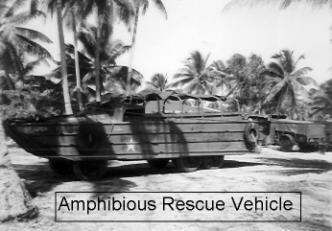 Although we were 200 miles away the worry of a tidal wave (tsunami) hitting our little island was enough to have the Navy give us a DUK (amphibious boat) with which to escape the island upon an emergency. When the bomb went off, fifteen hundred feet above the Eniwetok Atoll, we got a May Day call to abandon Bikini. It took 20 minutes for the sound and shockwaves to hit us. Just as it did, one of the guys was leaping aboard and the shockwave knocked him off the gunnel into the sand, uninjured. The sound wave was like a large caliber gun being shot near your ear. We drove off the island and cruised around the lagoon for a while and then the all clear sounded. Looking down into the lagoon, we could see the debris made by other atomic tests a few years back. Many large sunken ships could be seen in the very clear water. By the way, we did a lot of snorkeling in the lagoon. Many beautiful tropical fish were to be seen. One time a friend and I were swimming in the lagoon and he put his feet down and felt something below him. Letting out a whoop he started swimming to shore as fast as he could. Turned out that he stepped on a huge manta ray swimming by. My buddy probably wet his pants, however, we couldn't tell, as we wore very little while there. But I digress. In early 1953, we scoped out nine smaller “shots” in Mercury, NV. I left the Army immediately when my two years were up. In early 1956 I hired on with the IBM company. My first couple years were spent as a customer engineer, repairing calculators and computers. At that time I was absorbed into the sales department as a systems engineer to install and program computers to the customer’s specs. This task continued until 1964 when I had learned all there was to learn (!? ), and I started my own business. I opened a computer service bureau. This is a shop where we purchased or leased large computers and provided computer services to those who were not familiar with nor wanted to get familiar with computers (probably frightened). We did such tasks as payrolls, accounts receivable, billing, inventories and so forth. During this time frame (early ‘70s), I served a couple of hitches on the greater South Bend School Board, chairing the Board for a term. 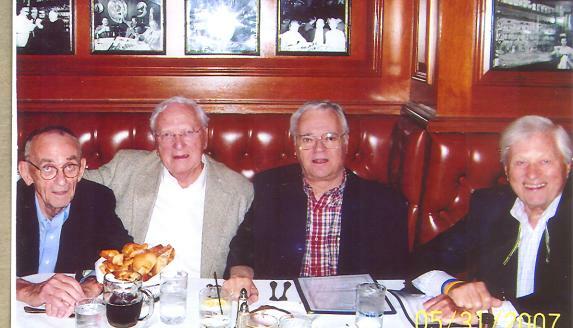 My little company fed my family nicely for 18 years, when I sold the business and shortly thereafter, Lauretta and I moved to Florida in 1985. At age 55 I was the youngest kid on the block. I considered myself fully retired and stayed that way until mid 2000 when the concept of Campion Forever started to wiggle around in my noodle. Then I got busy again. Operation Ivy was the eighth in a series of American nuclear tests, coming after Tumbler-Snapper and before Upshot-Knothole. The purpose of the tests was to help upgrade the U.S. arsenal of nuclear weapons, in response to the Soviet nuclear weapons program. The two explosions were staged in late 1952 at the Pacific Proving Ground in the Marshall Islands.The first device, code-named Mike, was notable for being the first successful test of a multi-megaton thermonuclear weapon design (the Teller-Ulam design), usually considered the world's first hydrogen bomb test. Too unwieldy to be deployed as a weapon, it was built to demonstrate the power and possibility of using nuclear fusion as a principle for larger-yield nuclear weapons than previously possible. 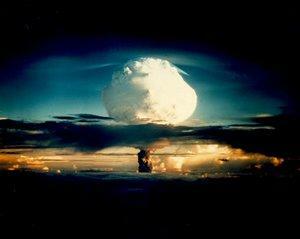 It was detonated on Elugelab Island in the Enewetak atoll of the Marshall Islands. It yielded 10.4 megatons of explosive power, over 450 times the power of the bomb that fell on Nagasaki. The detonation obliterated Elugelab, leaving an underwater crater 6,240 ft (1.9 km) wide and 164 ft (50 m) deep where an island had once been.The second test, King, was a test of the largest nuclear weapon ever built at the time which utilized only nuclear fission as the source of its energy (it had none of its energy added from fusion or fusion boosting). It was dubbed the "Super Oralloy Bomb", and was intended as a backup if the fusion weapon was a failure. It had a yield of 500 kilotons — substantially smaller than a hydrogen bomb but still 25-40 times more powerful than the weapons dropped during World War II. November 1, 1952, Operation Ivy, at Eniwetok Atoll, mankind enters the thermonuclear age with the detonation of the scientific device code named Mike. According to the DNA Fact Sheet, Joint Task Force (JTF) 132 included a total of 11,650 personnel, 9,350 were military and 2300 civilian. The civilian and over 6,600 of the military operated from Eniwetok Atoll and task force ships. Most of the remaining military were Air Force personnel who were based at Kwajalein 360 nmi southeast of Eniwetok. During the operation a single-place airplane used in air sampling was lost at sea with it's pilot. This led to the radiation exposure of 10 to 17 r for the 7 man aircrew who flew to assist the pilot. This crew crossed a zone of fallout in order to reach the area of the downed plane. A crew of twelve in a second aircraft were overexposed when caught in fallout while on a photographic mission during the Mike shot. JTF ships, Parry and Eniwetok islands all received fallout from the detonations of Mike and King shots. Of the 11,650 personnel, only 408 were said to have received no radiation during the operation. There are still choice condominium units available that are overlooking the Gulf of Mexico. This may be the best of our all-class reunions. Chuck Lambeck has us in a great environment. Don’t forget that your hard-earned dollars are due prior to January 22. I just received your July 07 CF newsletter - always a treat - and it prompted me to fire off this offering for any upcoming issues. The text was actually in the guest book of Tom Olson's website (I may have given you a 'heads up' about it at the time). It seems that the Prairie du Chien Correctional Facility is to expand - they plan to put as many as 240 men in Xavier Hall, Campion's senior residence after 1965. I don't know about you, but that seems to be cruel and unusual punishment, in my opinion. It bordered on tight with two occupants, as I recall. 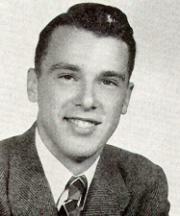 The 2005 picture of Xavier Hall is from the Class of 1966 website. It's taken at the corner of the campus where the infirmary used to be (now torn down), looking south. One can make out Marquette and Lucey Halls in the distance on the left of the picture. Well, don't get arrested in WI, or you may find yourself back at school (or what's left of it). Recently, while going through an airport during one of his many trips, President Bush encountered a man with long gray hair and beard, wearing a white robe and sandals, holding a staff. Presdent Bush went up to the man and said, "Has anyone told you that you look like Moses?" The mandidn't answer. He just kept staring straight ahead. The president said, "Moses!" in a loud voice. The man just stared ahead, never acknowledging the president. The president pulled a Secret Service agent aside and, pointing to the robed man, asked him, "Am I crazy or does that man not look like Moses to you? The Secret Service agent looked at the man and agreed. "Well," said the president, "every time I say his name, he ignores me and stares straight ahead, refusing to speak.. Watch!" Again the president yelled, "Moses!" and again the man ignored him. The Secret Service agent went up to the man in the white robe and whispered, "You look just like Moses. Are you Moses?" The man leaned over and whispered back, "Shhhh! Yes, I am Moses. The last time I talked to a bush, I spent 40 years wandering in the desert and ended up leading my people to the only spot in the entire Middle East with no oil." That’s it for this time. Hope all of you have a great 2008, and that we will still all be together next year at this time.